A few weeks ago, about 750 engineers, algorithm designers, systems engineers, marketers, and businessmen spent a long but productive day together at the Embedded Vision Summit. The field of computer vision, and embedding it into high-volume consumer products, is growing rapidly, and the summit is one of the key events of the year. Key trends highlighted in the report: CNNs, augmented reality and wearables, algorithms, and automotive. 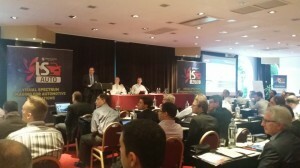 This was the 2nd year that the Image Sensor Auto conference took place, again in Brussels. 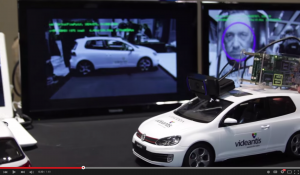 The Embedded Vision Alliance recently published two videos that highlight our presence at the show. The first video gives an overview of the demonstrations we had on display. The second is a video of our 30-minute tutorial presentation on Structure from Motion. Structure from motion uses a unique combination of algorithms that extract depth information using a single 2D moving camera. The tutorial discusses how you can use a calibrated camera, feature detection, and feature tracking, to calculate an accurate camera pose and a 3D point cloud representing the captured scene. 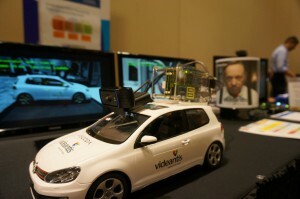 This 3D scene information can be used in many ways, such as for automated car parking, augmented reality, and positioning. The search giant last week announced that its self-driving prototype vehicle has hit the open road — in Mountain View, anyway. Google’s car is designed to operate without a steering wheel or pedals, but California rules require that vehicles have them for testing, so “we’ll have safety drivers aboard with a removable steering wheel, accelerator pedal, and brake pedal that allow them to take over driving if needed,” Google said. The sport of training software to act intelligently just got its first cheating scandal. In May, Chinese search company Baidu announced that its image recognition software had inched ahead of Google’s on a standardized test of accuracy. In June, the company admitted that it achieved those results by breaking the rules of that test.